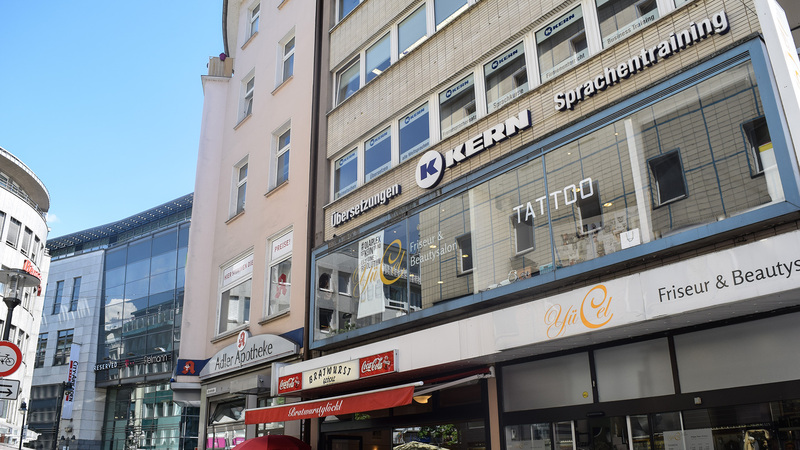 Welcome to KERN's translation office in Wuppertal! With about 350,000 inhabitants, Wuppertal is the largest city in the Bergisches Land region and represents its industrial, economic, educational, and cultural center. Wuppertal is best known for the Schwebebahn, a suspension railroad which officially opened in 1901. The 13.3 km (8.3 mile) long line became a landmark shortly after its opening. Today, the local transport system is used by over 75,000 passengers a day. In addition to this, the university city is known for the internationally renowned Pina Bausch Dance Theater, the historical civic center, the Von der Heydt Museum of Fine Arts, and the innovative Wuppertal Institute for Climate, Environment and Energy. Due to the considerable differences in altitude within the city, there are numerous steep streets and many steps. There are 469 public stairways with a total of 12,383 steps, and 23 of the stairways have landmark status. Thanks to its numerous steep, straight streets, Wuppertal is also known as Germany's San Francisco.